The Neo Buoyancy aid is a new design, which features a neoprene outer shell for tighter and stylish fit, while its buoyant material is soft PVC offering a new level of comfort and buoyancy. It also features two webbing moving fasteners for total safety, plastic zip, net holes for removing water and SOLAS retro reflective tapes. Approved to the latest European standards for 50 Newton buoyancy aids, ISO 12402-5. All of its raw materials are certified per ISO 12402-7 and ISO 12402 -8 for higher strength, quality and durability. 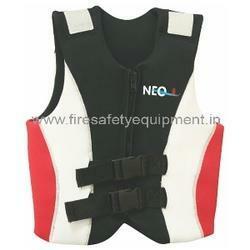 It is available in 5 sizes, in white/red/black colour combination.